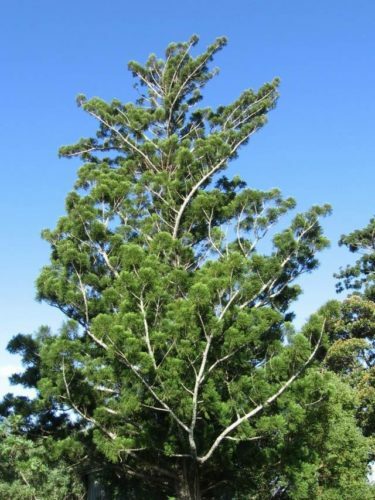 Araucaria cunninghamii, first described by William Aiton ex David Don in Aylmer Bourke Lambert (1837), is commonly known as the Hoop pine. Other less commonly used names include Colonial pine and Queensland pine. 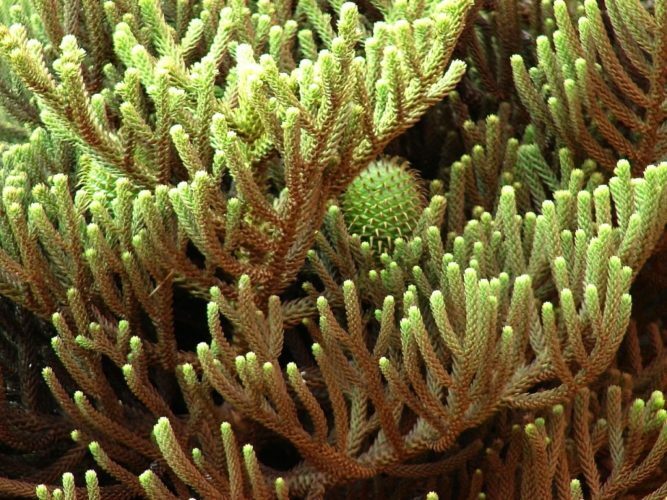 The scientific name honors the botanist and explorer Allan Cunningham, who collected the first specimens in the 1820s. Araucaria cunninghamii var. cunninghamii — Australia, from northeast New South Wales to east-central Queensland, occurring at sea level to 3,500 feet (0 - 1,000 m) elevation. 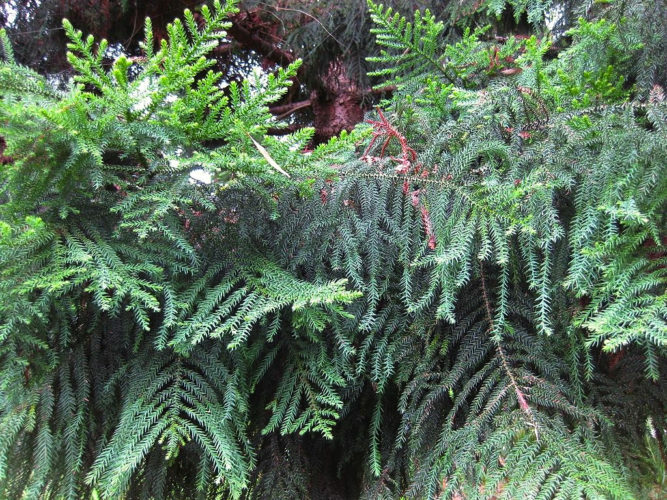 Araucaria cunninghamii var. papuana — New Guinea, on the mountains of Papua New Guinea, and in Indonesia — Irian Jaya, occurring at 300 to 8,600 feet (100 - 2,700 m) elevation. Description. 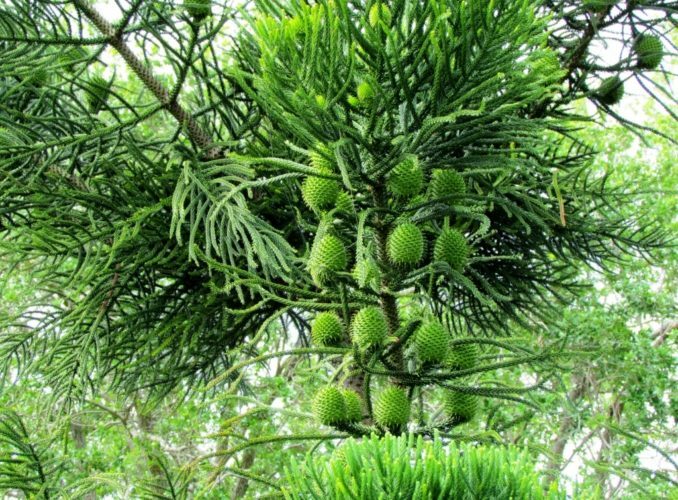 Hoop pine is an asymmetrical, evergreen coniferous species of tree which will grow to mature height of 200 feet (60 m) tall with a 12 foot (4 m) girth. Its bark is rough, growing in horizontal bands, and exfoliating in fine circular bands. Branches are long, branchlets appear in tufts at the branch ends. Seasonal branchlets are up to 0.8 inch (2 cm) in diameter. Juvenile leaves are spirally arranged, green or glaucous, with entire, flattened margins and stomata on both surfaces. Adult leaves scale-like, 0.3 to 0.8 inch (0.8 - 2 cm) long and are incurved, acute, imbricate, and keeled on both sides with stomata on both surfaces. 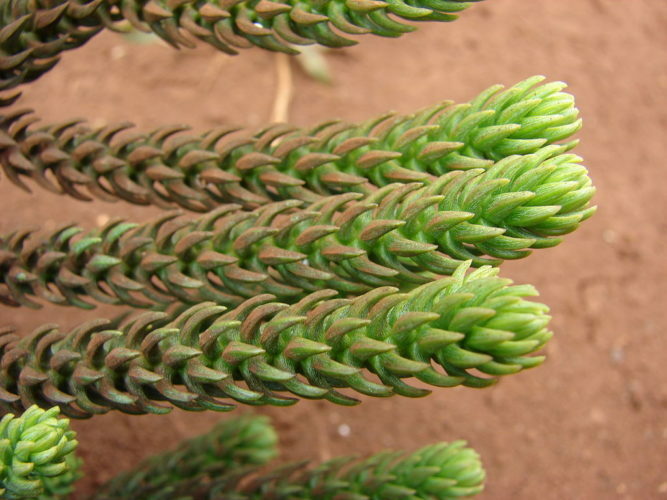 Pollen cones are cylindrical, 0.8 to 1.2 inches (2 - 3 cm) long by 0.2 to 0.28 inch (5 - 7 mm) wide. Microsporophylls are rhombic and obtuse. 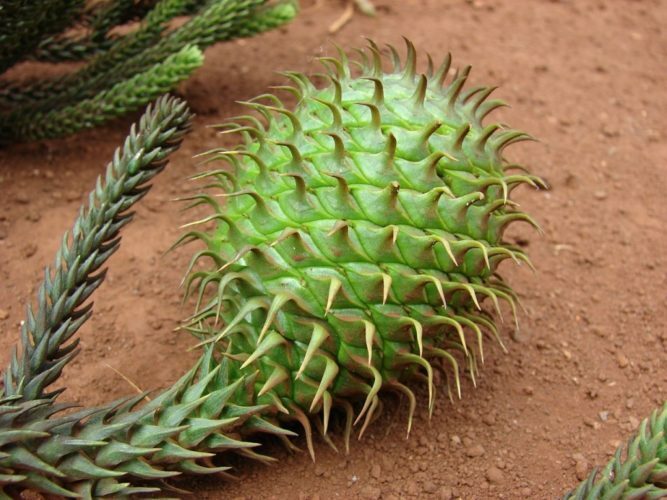 Seed cones are ovoid, symmetrical, 3.2 to 4 inches (8 - 10 cm) long by 2.5 to 3.2 inches (6 - 8 cm) wide with scales having longer reflexed spines than the New Guinea plants. Seeds are 0.6 inch (1.5 cm) long by ca. 0.25 inch (6 - 7 mm) wide, with narrow wings. Distribution. This species is native to Australia — coastal tropical and subtropical rain forests from northern Queensland to Coffs Harbour in New South Wales, at sea level to 3,500 feet (0 - 1,000 m) elevation. Variety papuana occurs in western New Guinea — the Arfak Mountains. The wood is a high quality timber that is particularly important to the plywood industry and also used for furniture, veneer, joinery, panelling, particle board, flooring and boats. Most natural stands in Australia and Papua New Guinea have been depleted by logging. It is now mainly found on timber plantations; however, the species continues to thrive in protected areas, including Lamington National Park where at least one walking track is named after it. At one time, the resin was used by Australian Aborigines as a cement. 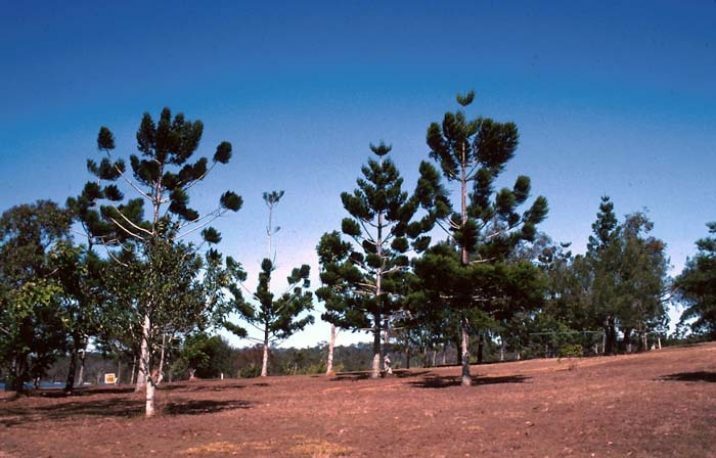 native range of Araucaria cunninghamii in New Guinea. Araucaria cunninghamii fruit. Location: Lanai, Kanepuu. 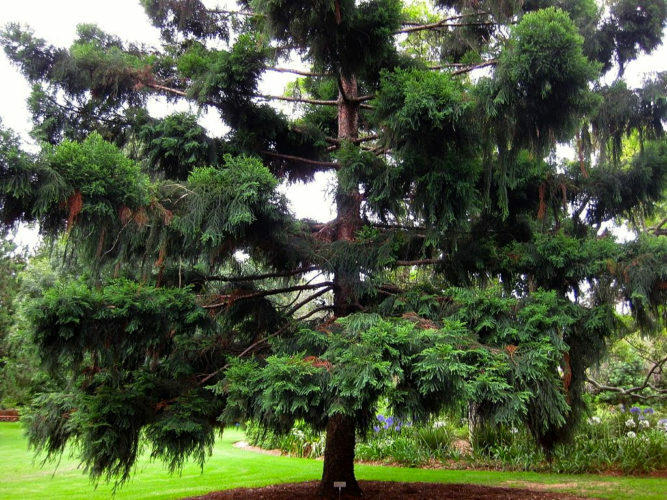 Araucaria cunninghamii — resplendent with cones; at Jardin Botanico Carlos Thais, Buenos Aires, Argentina. 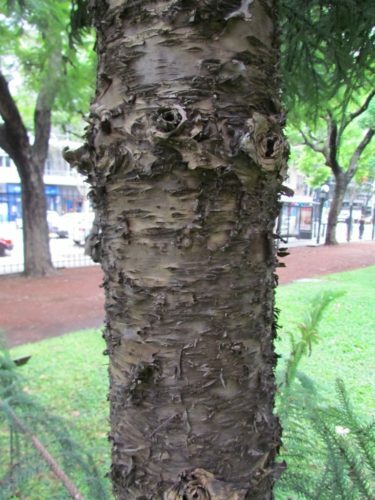 Aracauria cunninghamii — a closeup of bark detail, at Jardin Botanico Carlos Thais, Buenos Aires, Argentina.